Life is what actually happens while you are planning something else. I locked the front door, and toddled off to sleep. At about 9:45 I woke up, and thought I could hear someone moving around in the house. I knew I had locked the door, so I thought this was most peculiar, but… my mother-in-law has a key, and sometimes comes during the day to drop off something for Ann or to complete some other errand. So I got up to see what was going on. My son Brian also has a key, so I was not too surprised when I went to the front of the house, to find out that Brian was out by the sawmill. It turned out he had been there since 7 AM, so it is nice that the saw engine is so quiet. I hadn’t heard it at all, though it was less than 100 feet from where I was sleeping. 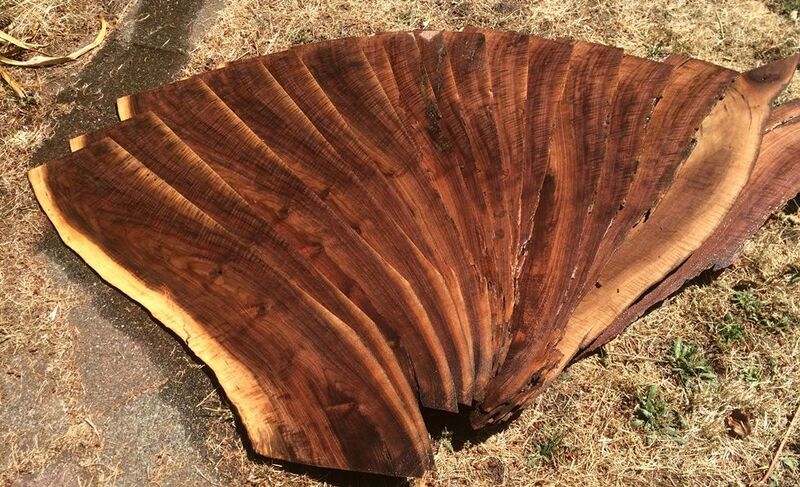 Four years ago, a neighbor had given Brian two small logs of black walnut. At the time he had no way to process them, so they had sat on the ground on a compost heap for all that time, fully exposed to the weather…hot, dry, cold, wet, freezing, and back again. But now that we have a sawmill, Brian had decided to get a little more practice with the saw, by slicing up those walnut logs. He did not anticipate that very much of the wood would be salvageable. But, even with the crooked shapes (they were limbs that had fallen in a storm), and the cracked ends (the ends had never been sealed against checking) and the rot and ant-damage from neglect on the ground, Brian got between 25 and 30 guitar sets out of those two little logs. They are exceptionally beautiful sets, too, as, when he started slicing, he found out that the walnut was highly figured, not just “plain” black walnut. Part of the pile of backs and sides cut from a single small log. all bookmatched sets, some good for two sets per pair. It took longer than it should have…. We are still learning to use the saw. It took us well over an hour to change the blade, because there were adjustments to be made that were not mentioned in the (extremely limited) manual. Maybe two hours of cutting time, an hour of “head-scratching” time learning the idiosyncracies of the tool, and an hour changing the blade. We stopped and ate, talked, took pictures, and had a good day together. Not what I had planned, but highly rewarding. 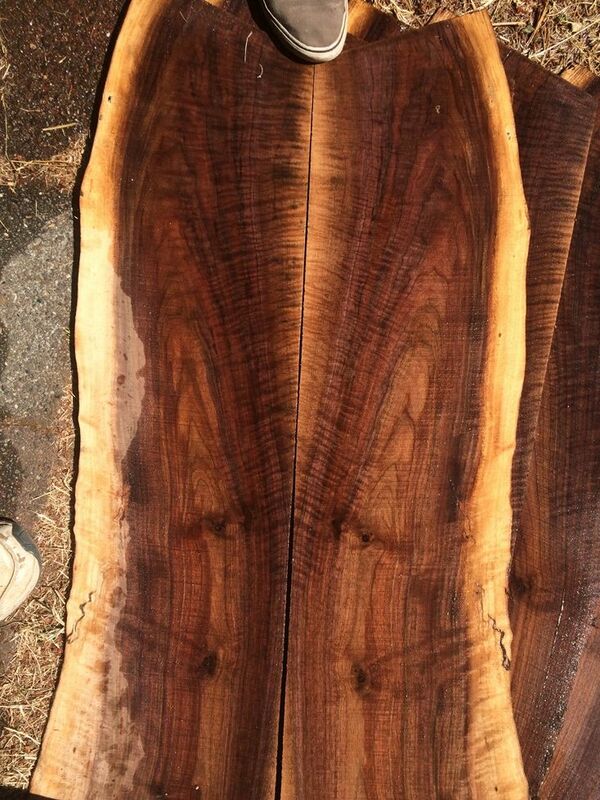 Bookmatched Black Walnut guitar back with water added to show the figure in the wood. This pair of bookmatched back pieces will make two guitar backs. One exceptional, one just very nice. Some of the sets are not big enough for two guitars but will make one guitar and one or two ukulele sets. And: fairly ordinary black walnut guitar sets (at a well-known supplier) sell for $150 (matched back and sides), so in the two or three hours he spent cutting up two small logs that were given to him, he produced enough guitar sets (extremely high-quality sets; not at all plain) to more than cover the purchase cost of the sawmill. (Yep. It pays.) There is hard work involved, but it is good work, and a good feeling of productivity, while salvaging wood that would otherwise have become firewood. And… we still have not started milling up the ton (or more) of curly maple for which we had originally bought the sawmill. This was not how I expected to spend the day, but it was pretty encouraging to see Brian driving home with all those guitar sets. When he makes a guitar of some of that wood, I will post a follow-up photo or two.